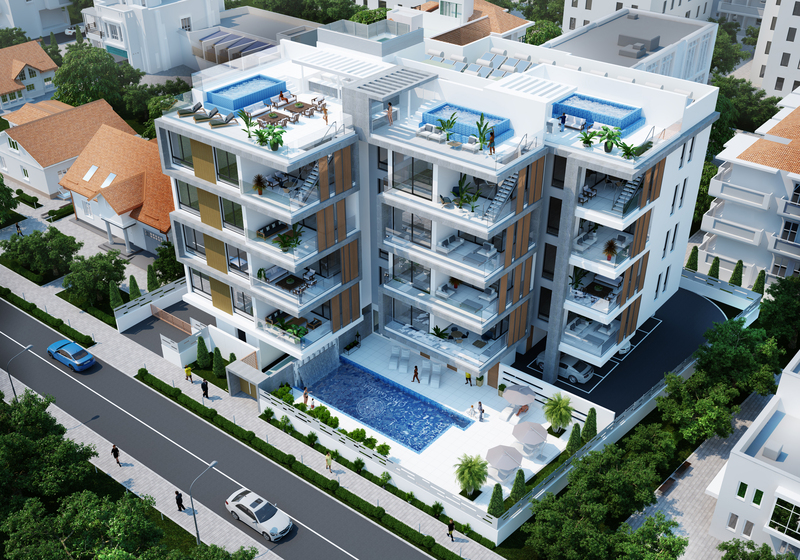 New amazing complex in Limassol - Olive Garden Residence! We are happy to announce the completion of the first stage of construction of the new amazing project in Limassol - Olive Garden Residence! The project is located in the most prestigious tourist area of Germasogia in the city of Limassol, well-known for its peaceful atmosphere and tranquility, surrounded by cozy cafes and right next to a beautiful sandy beach. Within walking distance from the complex there is a beach with all the necessary facilities (300 m), and an eucalyptus park Dassoudi (200 m). The infrastructure of the area offers everything needed for a comfortable living, including schools, kindergartens, a hospital, supermarkets, souvenir shops and restaurants. The international airports of Larnaka (70 km) and Paphos (65 km) are within 45 minutes’ drive. The residential complex Olive Garden Residence is a four-storey building with 16 apartments, located in a closed area of 2300 m2 with a common entrance, covered parking for 20 cars and a communal pool. On the 4th floor there are 3 penthouses with their own garden and a swimming pool on the roof. Each of the ground floor apartments has their own storage room, and the penthouses have an extra storage space on the roof. The interior design of the Olive Garden Residence was inspired by the idea of space and light modeling and laconic use of natural finishing materials. The furniture, fixtures and garniture elements are interconnected and all carefully selected to be in line with the interior details. They are harmoniously combined together, complementing one another, creating the overall integrity of space and emphasizing the modern style of the interior. As a result of a tender, the main contractor involved in the construction of the project, was chosen to be a top A category –contractor with over 30 years of experience in construction. The beam-free technology for reinforced concrete ceilings introduced in the project ensures high resistance to bending loads. In addition such technology significantly lowers the possibility of cracks formation in the concrete, which increases the overall durability of the entire construction. In order to ensure the transparency of the process on the construction site, online monitoring is available - https://www.ipcamlive.com/olivegarden . Video surveillance provides a real picture of the construction process. For more detailed information, contact the specialists of Relux Estates!